Leasing Available from $39.88 per month! The ColorQube 8880 color printer means big savings on color printing thanks to its incredibly low total cost of ownership. You get a powerful, no-fuss and waste-conscious printing solution that delivers exceptional color quality, consistently. - - Less waste, less impact. Packaging for the printer and solid ink sticks helps you create up to 90% less waste, up to 30% lower lifecycle-energy demand and a carbon footprint that's up to 30% smaller than comparable laser printers. - - EarthSmart print driver settings. Easy-to-use print-driver gauge allows you to choose the most environmentally conscious print settings. - - Optimize energy usage. Intelligent Ready technology learns your workgroup's usage patterns and moves to low-power mode when you're least likely to use it. - - Bundled GreenPrint software. Use the standard GreenPrint tool to help you print only the pages you want for reduced paper and ink usage. - - Color for black-and-white prices. With the ColorQube 8880 you can afford to print all your documents in attention-grabbing color. - - Pay for the color you use. With flexible pricing plans you'll stop paying expensive per-page prices for low-coverage documents. - - The print volume advantage. If you print at least four reams of paper each month, the ColorQube 8880 will deliver a total cost of ownership that's hard to beat. - - Save shipping costs and storage space. Compared to toner, solid ink's smaller packaging costs less to ship and is small enough to fit in a desk drawer. - - Always superior color. Solid ink gives your documents rich, vibrant colors on all media, including recycled paper. - - The colors you expect. PANTONE approved solid-color simulations and Xerox color correction technology deliver results that always match your expectations. - - More printing for longer. 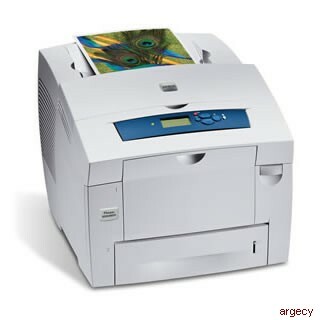 A high monthly duty cycle of up to 120,000 images means you'll have a reliable color printer for many years to come. - - Choose productivity. Add more memory to enable a variety of security and time-saving capabilities with a choice of two productivity kits. - - Easy expandability. Adding additional media trays increases total media capacity up to 2,200 sheets for periods of high workload and enables multiple tray sources for your diverse office printing needs. - - Intuitive color correction. The Color By Words feature lets you select desired color modifications from a simple drop-down list. - - Apple AirPrint -. Simplify printing of email, photos and important office documents directly from your Apple products with no drivers to install. - - Mopria certified. Mopria certification simplifies the mobile printing experience for tablets and smartphones to many printing devices, including the ColorQube 8880. - - The optional Xerox Wireless Print Solutions Adapter seamlessly connects your Xerox printer or MFP to modern mobile and desktop workflows, regardless of your office environment. 1 Average standard pages. Declared Yield in accordance with ISO/IEC 24711. Yield will vary based on image, area coverage and print mode. 2 Approximate pages. Declared Yield based on letter-/A4-size 20 lb. (75 gsm) pages. Yield will vary based on media type, size, weight, orientation, and usage patterns.